Draft: 2002, Los Angeles Dodgers, 17th rd. Russell Nathan Jeanson Coltrane Martin Jr. … his father, Russell Sr., is an accomplished saxophone player and played the National Anthem on his saxophone before a Dodgers/Pirates game on September 20, 2006 at Dodger Stadium and at Olympic Stadium prior to a Blue Jays/Reds exhibition contest in 2015… lived in Paris from ages 8-10...Is a graduate of Polyvalente Edouard-Montpetit High School in Montreal, the same high school attended by Eric Gagne… played third base at Chipola Junior College in Marianna, FL...was slated to attend North Carolina State University before being drafted by the Dodgers…selected to play for the Canadian team in the 2000 World Junior Championships...also chosen as a member of Canada's qualifying team for the 2004 Olympic Games…0n June 18, 2009, announced a donation of $600,000 over the next 10 years to the ONE DROP Foundation, whose mission is to fight poverty by supporting access to clean water…originally drafted by the Dodgers in the 17th round of the First-Year Player Draft out of Chipola College. Played in 90 games for Toronto slashing .194/.338/.325 with 25 RBIs and 10 home runs ... Started 71 games at catcher, 21 games at third base and three games at shortstop while making one appearance in the outfield ... Recorded his only three-RBI game of the season on April 6 against the Texas Rangers, finishing 3-for-4 with a home run in an 8-4 win for the Blue Jays ... Allowed just three passed balls from behind the plate while throwing out 10 would-be base stealers on 68 total chances. Ranked 2nd in 2017 with a .516 OBP in close-and-late situations (J. Altuve - .529)…Finished 5th in the AL with 16-BB in such plate appearances ... Led all catchers with 47 walks…Since joining Toronto in 2015, ranks 2nd among catchers with 149-BB (Y. Grandal-158), which is also 3rd most by a Jays catcher all-time (Whitt-384, Zaun-225) ... Made nine starts at third base, one more than his previous career high in 2008 ... Was limited to a career-low 91 games as he was placed on the DL twice ... On April 12 vs. MIL, snapped an 0-for-20 stretch to begin the season…That marked the longest hitless streak all-time by a Blue Jay to start a season ... Spent 12 games on the DL with nerve irritation in his left shoulder from May 8-19 ... Had a streak of reaching base safely snapped at 14 games (.433 OBP/.871 OPS) on May 24 at MIL ... Homered in consecutive games on May 29 and 30, doing so for the first time since Sept. 13 and 15, 2016...Homered in back-to-back games again on July 5 and 6 ... Hit his 6th HR of the season on June 14 vs. TB, a game-winning blast in the 8th inning (broke a 6-6 tie)…Marked the 12th HR of his career to tie the game or give his team a lead from the 8th inning on (last: Sept. 4, 2016 at TB) ... Recorded an RBI in five straight contests (6-RBI) from July 30-Aug. 4, his longest RBI streak since Aug. 13-20, 2016 (six games, 11-RBI) ... Left the game on Aug. 11 and was placed on the DL from Aug. 12-Sept. 12 with a strained left oblique ... Doubled twice and drove in three runs on Sept. 24 vs. NYY…The 3-RBI tied his season best (also May 29 vs. CIN). Rod Barajas also hit 7-HR in August, 2009...Collected 22-RBI in August (20 as a catcher)...The 20-RBI tied the club record for most RBI by a TOR-catcher in a single month…Darren Fletcher had 20-RBI in June & August, 1999 & Ernie Whitt recorded 20-RBI in September, 1987...Hit 7-HR with 19-RBI over an 11-game span from Aug. 13-26...Recorded his 20th HR of the season on Sept. 20 at SEA...He and Michael Saunders became the first pair of Canadian-born teammates to each hit 20 home runs in a single season...Hit 6-HR over a six game span from Aug. 13-20...Only one other Blue Jays player homered at least six times as a catcher over a six-game span as Ernie Whitt did it in September 1987....Jonathan Lucroy (Aug. 4-12) is the only other catcher last season with six homers over a six-game span....Had a career best 22 game on-base streak snapped Aug. 5 at KC (.415 OBP over span)...Hit a solo shot to lead off the 9th inning on Aug. 1 at HOU, tying the game at 1-1…It marked the 1st time he had tied a game with a HR in the 9th inning…It was the 150th home run of his career...Recorded only three hits in 33 at-bats in the postseason (.091 average)…Struck out 14 times in those 33 at-bats, including nine times in the ALCS - a club record…Struck out at least once in each of his last eight games of the playoffs. Marked his sixth consecutive postseason appearance…His teams have made the playoffs in eight of the last nine seasons ('16, '15, '14, '13, '12, '11, '09, '08, '06) and nine of the last 11 seasons... Collected his 36th career postseason hit in game five of the ALCS to surpass Hall of Famer James "Tip" O'Neill for most its in a postseason by a Canadian-born player…Tip O'Neil had set that record in 1888.... Drove in at least one run from June 9-16, a career-high seven straight games (10 RBI total)...Became 14th player in club history to record a RBI in seven straight games & first catcher in club history...Hit his first home run of the season May 25 at NYY, a total of 124 AB to hit his 1st HR of the campaign, the longest stretch to begin a season with a HR since 2009 (217 AB)... Snapped a streak of nine consecutive strikeouts April 29 after hitting a single in the 7th inning...Those nine strikeouts in nine straight plate appearances set a Blue Jays record. Finished the season with a caught stealing percentage of 38.4, having thrown out 25 attempted base stealers (65 attempts)… Those 25 CCS ranked 2nd in the AL (McCann-26). Among AL catchers ranked 1st in WAR (3.5), T-1st XBH (46), 2nd in 2B (22), RBI (74) & HR (22) and 5th in hits (102). Clubbed his 23rd home run of the season October 2 at TB… Those 23 home runs set a new career high…It was his 22nd HR as a catcher, 2nd most by a catcher in a season in club history (Arencibia, 23 in 2011)… His 46 extra base hits as a catcher this season also rank 2nd in club history behind Arencibia (47-2011). Drove in 18 runs in 16 games vs. NYY matching the most RBIs against the Yankees in a single season by one of their former players in more than 50 years... Boston's Mike Lowell, who appeared in eight games for the Yankees in 1998, had 18 RBI against them during the 2007 campaign. Recorded his 10th career multi-HR game (2nd this season) on Sept. 11 at NYY. Hit his 16th HR of the season on August 29 vs. DET... It was his first HR since July 30 vs. KC. July 2 vs. BOS hit his 12th HR, surpassing his entire total from 2014. Stole his 4th base of the season, June 24 at TB, matching his stolen base total from 2014. June 13 at BOS had three passed balls and a go-ahead home run in the top of the 11th inning, ending his streak of 15 consecutive hitless at-bats in extra innings…He's the first player to hit a home run and have three passed balls in one game since Jason Varitek hit a home run and had five passed balls (Wakefield) for Boston in 1999. Hit the first three-run triple of the season by a big-league catcher on June 12 at BOS, and the 2nd of his career… In 2006, playing for the Dodgers, hit a three-run triple at Colorado…The only other active catcher who has generated a pair of threerun triples in the Majors is Jonathan Lucroy, who did so twice within a span of 10 games in June 2013. Stole home as part of a double steal (7th inning) in game 2 of a DH at WSH on June 2…It marked the 1st time in his career to steal home…Became the first Jay since Brett Lawrie on April 22, 2012 at KC to swipe home. Appeared at 2B for the 2nd time in his career (last: Aug 20, 2011 at MIN) on May 27 vs. CWS (9th inning), finishing with one assist (1 TC). Hit a triple for the 1st time since Sept. 9, 2007 at SF (8th career), at HOU on May 16…It was the 1st 3B by a TOR catcher since Josh Thole on Aug. 16, 2013 at TB. Snapped a 0-for-23 streak with a HR in the 2nd inning vs. ATL, April 17…Would later hit his 2nd HR in the 8th inning…It was his 9th career multi-HR game (last: April 9, 2014 at CHC). Was selected to represent Toronto for the 86th All-Star Classic in Cincinnati...Marked his 4th selection (2007-2008, 2011), and his 2nd time as a starter (2007 with LAD)...Is the 3rd Blue Jay catcher overall (John Buck-2010, Ernie Whitt-1985) to be selected as an all-star. Ranked third in the National League with a .360 average with RISP...Hit .343 at PNC Park and reached base safely in 50 of his 53 home games...Threw out 28 runners attempting to steal; ranked 2nd behind San Diego's Rene Rivera (29)...Ranked 1st among NL catchers in OBP (.406), 3rd in batting average (.295) and 4th in RBI (67)...Made 1000th career start at catcher on June 13 at Miami...Recorded 1000th career hit on August 13 at Detroit; a double off Buck Farmer...Was on the disabled list from April 26-May 21 with a left hamstring strain...Missed last two regular season games with tightness in left hamstring...Had a season-high 13-game hitting streak from Sept. 7-22 (17-for-48, .354)...Hit .302 (57-for-189) in 55 games after the All-Star break. 2013 SEASON: Made 120 appearances (117 starts) behind the plate in his first season with the Pirates...Threw out 29 of the 70 runners attempting to steal against him (41%) - the 29 caught stealings ranked first among all Major League catchers...Led National League catchers with a .998 fielding percentage; committed just two errors in 990 total chances...His 3.14 catcher's ERA ranked second among MLB backstops with at least 100 games caught (A.J. Ellis led with a 3.05 catcher's ERA)...Also ranked third in the N.L. with three pickoffs...Ranked third among N.L. catchers with 1051.0 innings caught and fourth with 117 starts...Was Pittsburgh's Opening Day catcher - his seventh straight Opening Day start...Recorded first stolen base on 4/8 at Arizona...Went hitless in his first 17 at bats and 2-for-31 (.065) in his first 10 games thru 4/13...Hit safely in his next eight games thru 4/23, going 12-for-27 (.444) with three doubles, two home runs and three RBI...Made 16th career appearance at third base on 4/15 vs. St. Louis; played final four innings there and had two chances...Hit first home run on 4/18 vs. Atlanta...Made start at third base on 4/20 vs. Atlanta; his ninth career start at the hot corner and his first since 8/20/08...Homered in back-to-back games on 4/27-28, which included his seventh career two-homer game on 4/28 at St. Louis...Was named National League Player-of-the-Week for the week of 4/22-28 after hitting .375 in six games and leading the National League with four home runs, a .958 slugging percentage and 23 total bases...Led the Pirates with six home runs hit in April...Made second start and final appearance at third base on 5/5...Was scratched from his start on 5/7 vs. Seattle due to neck stiffness and missed two games...Played game on 5/9 at New York, but missed next four with neck discomfort...Returned to action on 5/14 vs. Milwaukee and went 2-for-4 with a pair of doubles and an RBI...Reached base safely in 15 straight starts from 4/26-5/21...Delivered walkoff single with the bases loaded in the 11th inning of 1-0 victory vs. Detroit on 5/30...Was ejected by home plate umpire Dan Iassogna for arguing balls and strikes while catching A.J. Burnett on 6/3 at Atlanta...Made first career start/appearance in right field on 6/4 at Atlanta; played first 5.2 innings there and had one putout...Hit his 100th career home run on 6/8 at Chicago...Had pinch-hit RBI single in Anaheim on 6/23 - his first pinch hit since 5/18/11 (had been 0-for-9)...Went hitless in 14 at bats from 6/25-28...Threw out two runners attempting to steal in the same inning on 7/4 vs. Philadelphia - the first Bucco catcher to do so since Mark Parent on 8/10/95 at San Francisco...Appeared in 1,000th career game on 7/14...Hit safely in six of his eight games from 7/14-28, going 11-for-27 (.407) and raising his season average from .236 to .253...Went 3-for-4 and also threw out his 20th baserunner attempting to steal on 7/23 at Washington...Swiped his final base on 7/28 at Miami...Connected for a three-run homer in a 5-1 Bucco victory on 8/4 vs. Colorado...Delivered his fourth walkoff hit of the season (eighth career); a 10th-inning single in a 5-4 win vs. Miami on 8/8...Homered in back-to-back games on 8/30-31...Made his 1000th career appearance at catcher on 9/7 at St. Louis...Homered six times in 14 games against the Cardinals. 2013 POSTSEASON: Went 5-for-17 (.294) with two home runs and six RBI in six games...Homered twice in the Wild Card Game vs. Cincinnati on 10/1 to become the eighth player in Major League history to hit two home runs as a catcher in a postseason game; that list includes Hall-of-Famers Yogi Berra (1956), Johnny Bench (1976) and Gary Carter (1986)...Also became just the second player in team history to have a multi-homer game in the postseason, joining Bob Robertson, who hit three bombs at San Francisco in Game Two of the 1971 N.L.C.S...Had two RBI in Game Two of the Division Series at St. Louis on 10/4 and another two RBI in Game Three at PNC Park on 10/6...Is the first catcher in MLB history to homer for three different teams in the postseason. Established career high in home runs, ranking fifth among American League catchers...Made 128 appearances (116 starts) behind the plate and caught 16 of the 63 baserunners attempting to steal against him (25.4%)...Made his sixth career Opening Day roster and sixth straight Opening Day start at catcher...Snapped an 0-for-16 stretch with his home run on 4/20 at Boston...Connected off James Shields for his fourth career grand slam on 6/5 vs. Tampa Bay...Went 3-for-4 in the game on 6/5, becoming the first Yankees No. 9 batter to record at least three hits and a grand slam since pitcher Spud Chandler on 7/2/40 at Comiskey Park...Hit a game-tying, two-run homer in the seventh inning and a "walkoff" solo homer in the ninth on 6/10 vs. New York (NL); was his sixth career multi-homer game...Became the second Yankees catcher since 1950 with at least two home runs in a game, including a "walkoff" home run, joining Yogi Berra on 9/16/55 vs. Boston...Went a career-long 30 at bats without a hit from 6/20 to 7/6...Was removed from the game on 6/23 due to a stiff back...Made two errors on 7/3 at Tampa Bay, just his third career multi-error game and first since 8/20/08 vs. Colorado...Snapped a 66 at bat homerless stretch in 7/16 win vs. Toronto, dating back to his two-homer game on 6/10 vs. the Mets...Batted .417 (10-for-24) with two doubles, two home runs and eight RBI over a seven-game stretch from 9/3-11...Hit a 10th inning walkoff home run on 9/21 vs. Oakland - his fourth career walkoff hit (all homers) and second of the season (also 6/10 vs. the Mets)...Collected his 20th home run on 9/28 at Toronto, surpassing his former career high of 19 home runs with the Dodgers in 2007...Hit safely in six of his final seven starts of the regular season, going 9-for-27 (.333) with two doubles, two home runs and five RBI...Hit a ninth-inning, game-winning solo home run in Game 1 of the American League Division Series at Baltimore...Became the first New York player to hit a go-ahead homer in the ninth inning or later in a postseason road game since Roger Maris in 1961...Caught 86.0 of the Yankees' 88.0 defensive innings during the postseason, including all 55.0 innings over a five-day stretch from 10/10 (A.L.D.S. Game 3) thru 10/14 (A.L.C.S. Game 2). Hit .237 (99-for-417) with 57R, 17 doubles, 18HR, 65RBI and 50BB in 125 games (118 starts at C) with the Yankees... also appeared in three games as a defensive replacement at 3B and one game at 2B...Caught 35 runners attempting to steal, leading all Major League catchers...Hit 18HR in 417AB after combining to hit 12HR in 836AB from 2009-10... 10 of his homers came in games in which he was not in the previous day's starting lineup or hadthe previous day off ...Led all Major League catchers with 8SB, third-most by a Yankee as a C since 1969 behind Joe Girardi (13SB in 1996) and Thurman Munson (12SB in '76)... tied for fourth among AL catchers in home runs and fourth in RBI...Was voted via player balloting to his third career All-Star team-and first with the AL... did not play in the NL's 5-1 victory... was the first Yankees All-Star catcher since Posada in 2007...Made his fifth career Opening Day roster-first with the Yankees-and fifth straight Opening Day start at C...Caught each inning of the Yankees' first 12 games of the season from 3/31-4/15... according to Elias, had been the only catcher in the Majors to catch all the innings of his team's games through 4/15...Stole third base in the third inning of 3/31 Opening Day win vs. Detroit... became the first Yankees catcher to steal third base since Jorge Posada on 4/19/00 at Texas and just the second since Thurman Munson on 8/12/75 at Oakland...Hit three-run HR and solo HR in 4/9 win at Boston, his second career multi-HR game... marked just the second time in the last 16 seasons (since 1996) that a Yankees catcher other than Jorge Posada had a multi-HR game (also John Flaherty on 8/16/03 at Baltimore-2HR)... joined Posada (8/30/03) as the only Yankees catchers to record a multi-HR game at Fenway Park over the last 70 years (credit: Elias)...Hit 6HR in April, 1HR shy of the single-season Yankees record for homers as a catcher during the month of April (Jorge Posada - 7HR - April 2003) - credit: Elias...Did not have an extra-base hit in a career-long 68AB stretch between his solo HR on 5/24 vs. Toronto and his three-run HR on 6/29 vs. Milwaukee-credit: Elias...Missed two games (5/29 at Seattle and 5/30 at Oakland) with a bruised left big toe...Snapped an 0-for-16 stretch with his first-inning single on 6/3 at Los Angeles-AL... matched the longest single-season hitless streak of his career...Batted .286 (22-for-77) with 14R, 7HR and 19RBI in 23 games in August... marked his most HR in any calendar month during his career and is tied for his second-highest single-month RBI total (20RBI in June 2006, 19RBI in April 2011 and May 2009)...Recorded his fourth career multi-HR game and third as a Yankee in 8/19 win at Minnesota... was batting ninth in the game, marking his second multi-HR from the ninth spot in the batting order (also 4/9 at Boston)... according to the Elias Sports Bureau, became the second player in Yankees franchise history to have a multi-homer game from the ninth spot in the batting order twice in one season, joining pitcher Red Ruffing (1930 and 1936)...Made his first career appearance at 2B in 8/20 loss at Minnesota, starting at C and moving to 2B in the seventh inning...Set a career high in hits and RBI and tied his career high in runs scored in 8/25 win vs. Oakland, hitting a solo HR and a grand slam and going 5-for-5 with 3R, 1 double, 6RBI and 1BB... the grand slam was the third of his career and the second of the Yankees' Major League record three GS in the game...Marked the 11th time in the Live Ball era (since 1920) that a Yankee recorded at least 5H and 6RBI in a game, first since Alex Rodriguez went 5-for-6 with 6RBI on 4/18/05 vs. Tampa Bay... marked the most hits by a Yankees catcher in a single game since Elston Howard went 5-for-6 on 4/18/59 at Boston... was just the fourth time in the Live Ball era that a Yankee recorded 5H in 5AB with at least 6RBI (also Danny Tartabull, 9/8/92 at Baltimore; Joe DiMaggio, 7/9/37 vs. Washington and Del Pratt, 8/23/20 vs. Detroit)... was the sixth time since 1920 a Major League catcher had at least 5H and 6RBI in a game, first since Joe Mauer on 7/26/10 at Kansas City (5-for-5, 7RBI)...Missed two games from 8/30-31 with a bruised left thumb... missed two additional games from 9/11-12 with a bruised right thumb... suff ered the injury on 9/10 at Los Angeles-AL in the bottom of the second inning (foul tip by Izturis)...Was ejected in the bottom of the fifth inning of 9/26 loss at Tampa Bay by HP Umpire Paul Schrieber... was his fourth career ejection and first since 6/27/10 vs. the Yankees (w/ Los Angeles-NL)...Grounded into a 5-4-3 triple play in the sixth-inning of 9/27 loss at Tampa Bay... was the 26th triple play hit into in Yankees history (first since 5/29/00 vs. Oakland)...Started all five ALDS games vs. Detroit, going 3-or-17 (.176) with 3R. Batted .248 (82-for-331) with 45R, 13 doubles, 5HR and 26RBI in 97 games with the Dodgers....hit in seven different spots in the lineup (one through three and six through nine)....batted .361 (26-for-72) with 5HR in the eighth spot in the order. ... Caught 19-of-62 potential basestealers (30.6%)....picked off four baserunners overa 13-game stretch from 6/4-22. ... Made his fourth consecutive Opening Day start at catcher for the Dodgers....recordedat least 1BB in each of his first eight games of the season. ... Hit 13th-inning, game-winning RBI single on 4/24 at Washington....drove in game-winningrun with eighth-inning RBI double on 7/25 vs. New York-NL. ... Hit safely in a career-high 15 straight games from 5/5-20, batting .305 (18-for-59)over the stretch. ... Suffered a season-ending right hip fracture and torn labrum while trying to scorefrom third base on a sacrifice fly on 8/3 vs. San Diego....was placed on the 15-daydisabled list on 8/4 and transferred to the 60-day D.L. on 9/6....was his first careerappearance on the disabled list. ... Appeared in just five games during spring training with the Dodgers, batting .286(4-for-14) with 2R and 1RBI....missed time after straining his groin on 3/6. Was voted as the starting catcher for the National League All-Star team and went on to win the Rawlings Gold Glove Award and the Louisville Slugger Silver Slugger Award, becoming just the second Dodger to ever garner both of those honors in the same season and the first since Dusty Baker in 1981...is just the third catcher, joining Gary Carter (1981-82) and Benito Santiago (1988, '90), to win both the NL Silver Slugger and Rawling Gold Glove in the same season...awarded the annual Roy Campanella Award as the "Most Inspirational Dodger," which is voted upon by his teammates and coaches...was also honored with the Dodgers' Heart & Hustle Award, which is chosen by the MLB Players Alumni Association...was nominated for the Hank Aaron Award, which recognizes the best offensive performer from each league...named to the Sporting News National League All-Star team after the season...led all National League catchers in hits (157), homers (19), runs (87), stolen bases (21), batting average (.297), on-base percentage (.380) and slugging percentage (.477)...swiped 21 bases to lead all Major League catchers and set the single-season Dodger franchise record by a catcher...tied the mark (18 steals) set by Con Daily in 1892 on Aug. 1 in San Francisco...broke it with two thefts on Aug. 18, his only multi-steal game of the year...the second base bag was placed in the Dodger archives following the game...became the first big league catcher to hit 15 homers and steal 20 bases in a season since Ivan Rodriguez in 1999...hit 10 or more homers in each of his first two seasons in the Major Leagues, joining Andre Ethier as the first Dodgers to accomplish that feat since Jim Lefebvre (1965-66)...led all Major League catchers with 145 games played and 1,254 innings caught...posted a 3.95 catcher's ERA, the fourth-best mark in the NL...cracked 32 doubles, giving him the most doubles in Los Angeles Dodger history after his first two full seasons (58)...surpassed Eric Karros' record of 57 in 1992-93. Led the Dodgers in runs batted in (87) and became just the sixth catcher in Dodger history to collect 80 RBI in a season, joining Roy Campanella (6 times), Mike Piazza (5 times), Paul Lo Duca, Joe Ferguson and Bruce Edwards (one time each)...started 143 games behind the plate, tying Mike Piazza (1996) for the franchise record for starts by a catcher...his 145 games caught ranked third behind Piazza (146 in 1993 and 1996)...was voted in as the starting catcher in the All-Star Game at San Francisco, becoming the first Dodger catcher to start the Midsummer Classic since Mike Piazza in 1997...when ballots were initially released, he was more than 140,000 votes behind the first-place catcher but came back to overtake Paul Lo Duca and start at AT&T Park in San Francisco...went 0-for-3 in the contest...became the first Canadian catcher in All-Star history and the shoes he wore during the game were sent to the Canadian Baseball Hall of Fame...became the third Canadian player to start an All-Star Game, joining Larry Walker (1997-99) and Jason Bay (2006)...was just the third Canadian Dodger to make an All-Star team, joining Eric Gagne and outfielder Grady Rosen, who was selected in 1945 but did not play...was named the Tip O'Neill Award winner at season's end as the top Major League player from Canada...became just the 11th Los Angeles Dodger to drive in 60 runs before the All-Star Break and the first since Jeff Kent, who had 60 RBI at the break in 2005...terrorized left-handers, hitting .357 with a .458 on-base percentage, which is the third-highest OBP by a Dodger in a season vs. lefties since 1974, behind Jimmy Wynn (.488 in 1975) and Mike Piazza (.477 in 1996)...batted .329 (91-for-277) on the road...homered in three consecutive games from May 30-June 1, a Dodger season high...scored a run in eight consecutive games from Aug. 15-23 to tie for a Dodger season high...set a career high and tied a Dodger season high with eight at-bats on April 29 at San Diego...caught all 17 innings of that game...blasted his first career grand slam and second career walk-off homer in the 10th inning on April 21 vs. Pittsburgh...the homer off Shawn Chacon was the 11th walk-off grand slam and the sixth extra-inning grand slam in franchise history...playing in front of about 40 family members and friends on June 19 in his first Major League game in his birth city of Toronto, homered and had two RBI against the Blue Jays...had a season-high 12-game hitting streak from June 21-July 2 where he batted .377 (20-for-53) with 12 RBI...registered his first-career multi-home run game on Aug. 15 against Houston, taking Jason Jennings deep twice...was the first Dodger catcher with a multi-homer game since David Ross on Sept. 14, 2003...won the fan vote on dodgers.com to have his likeness depicted on the Aug. 2 Bobblehead Night, marking the first time in Los Angeles Dodger history that fans decided who would be on a promotional giveaway. Established himself as an NL Rookie of the Year candidate, hitting .282 with 10 homers, 26 doubles, 65 RBIs, 65 runs scored and 10 stolen bases in just 121 games. The Dodgers were 71-43 (.623) when he started behind the plate. Ranked among the NL rookie leaders in average (.282-T-9th), runs (65-7th), doubles (26-T-7th), triples (4-8th), RBIs (65-7th), walks (45-T-7th), total bases (181, 10th), on-base percentage (.355-8th), extra-base hits (40, 9th). Called up from Triple-A Las Vegas on May 5 when starting catcher Dioner Navarro fractured his right wrist, and Martin was the starting catcher from that point forward. His 65 RBIs were the third-most by an NL catcher and the most by a Dodger backstop since Paul Lo Duca had 72 in 2001. Joined John Roseboro and Benito Santiago as the only catchers in history with 10 or more homers and stolen bases in their rookie season. After being recalled on May 5, caught 117 games, the most of any NL catcher and second in the Majors behind Jason Kendall (118). His 1,015 innings caught during that span ranked second in the Majors, and he committed just six errors. Made his Major League debut on May 5 and collected his first Major League hit with an RBI double to right off Milwaukee pitcher Chris Capuano. Hit .366 (26-for-71) with a .521 slugging percentage against left-handed pitching, but eight of his 10 home runs came off righties. Hit .319 (67-for-210) with 15 doubles, eight homers, 41 RBIs and 38 runs scored at Dodger Stadium. Threw out 26 percent of the baserunners attempting to steal on him (25-for-96). Hit the third of four consecutive home runs in the ninth inning on Sept. 18 against the Padres, drawing the club within one run at 9-8, and was the first time the Dodgers went back-to-back-to-back since Aug. 5, 2004. At the time of his callup, was hitting .297 (22-for-74) at Las Vegas and leading the squad with nine doubles. He was 4-for-12 in the playoffs. Ranked third in the Double-A Southern League with a .311 batting average while helping the Jacksonville Suns to the Southern League championship ... Had a .430 on-base percentage, the second-best mark in the Southern League ... Selected to play for the World Team in the 2005 XM Satellite Radio All-Star Futures Game ... Was named to the year-end Southern League All-Star team ... Was rated as having the best strike zone judgment and as the best defensive catcher in the Southern League and in the entire Dodger farm system by Baseball America ... Earned Southern League Hitter of the Week honors during the week of May 30-June 5 ... Tabbed as the sixth-best prospect in the Dodger organization entering 2005 by Baseball America. Was invited to Spring Training as a non-roster player with the big-league club and appeared in four exhibition games ... As the club's regular catcher, was instrumental in Single-A Vero Beach's drive to an overall 78-57 record and aFlorida State League East Division second-half championship ... Selected to play in the FSL All-Star Game and was also chosen to the season-end FSL All-Star Team ... Topped the FSL with 71 walks Scored four runs in a game on three occasions ... Following the season, played for the Scottsdale Scorpions in the Arizona Fall League and batted .296 (16-for-54) with nine RBI in 17 games...was rated as the eighth-best prospect in the AFL by Baseball America. Converted to catcher and split season between Single-A South Georgia and Rookie-level Ogden ... Began with South Georgia and hit .286 in 25 games for the Waves...moved on to Ogden at the start of the Pioneer League campaign in June and batted .271 with 13 doubles, six homers and 36 RBI in 52 games with the Raptors ... Led Pioneer League catchers with 63 assists ... In 20 August contests, hit .328 (21-for-64), collecting five homers, six doubles, 14 walks and 18 RBI. Was the regular third baseman for the Rookie-level Gulf Coast League Dodgers ... Had a .286 batting clip in 41 games ... Hit .095 in his first eight games, but batted .324 (36-for-105) the remainder of the season. 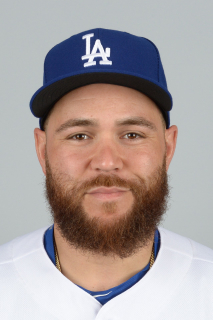 April 10, 2019 Los Angeles Dodgers placed C Russell Martin on the 10-day injured list. Low back inflammation. January 11, 2019 Los Angeles Dodgers traded RHP Andrew Sopko and SS Ronny Brito to Toronto Blue Jays for cash and C Russell Martin. September 14, 2018 Toronto Blue Jays activated C Russell Martin from the paternity list. September 11, 2018 Toronto Blue Jays placed C Russell Martin on the paternity list. September 12, 2017 Toronto Blue Jays activated C Russell Martin from the 10-day disabled list. May 20, 2017 Toronto Blue Jays activated C Russell Martin from the 10-day disabled list. May 8, 2017 Toronto Blue Jays placed C Russell Martin on the 10-day disabled list. Left shoulder nerve irratation. November 18, 2014 Toronto Blue Jays signed free agent C Russell Martin. October 30, 2014 C Russell Martin elected free agency. May 22, 2014 Pittsburgh Pirates activated C Russell Martin from the 15-day disabled list. April 26, 2014 Pittsburgh Pirates placed C Russell Martin on the 15-day disabled list. Strained left hamstring. November 30, 2012 Pittsburgh Pirates signed free agent C Russell Martin. November 3, 2012 C Russell Martin elected free agency. December 16, 2010 New York Yankees signed free agent C Russell Martin. December 2, 2010 C Russell Martin elected free agency. November 2, 2010 Los Angeles Dodgers activated C Russell Martin from the 60-day disabled list. September 6, 2010 Los Angeles Dodgers transferred C Russell Martin from the 15-day disabled list to the 60-day disabled list.